Erwin Chemerinsky, the new dean of Berkeley Law, has been making waves in campus politics regarding free speech issues. Chemerinsky is a major constitutional law scholar, an outspoken liberal and a free speech absolutist. He’s the perfect figure to defend the UC Berkeley’s administration from people who are angry about far-right provocateurs and hundreds of cops being on campus. At speaking events and in writing, he has mainly argued that the administration is following First Amendment requirements to not discriminate on the basis of political ideology. At a recent administration-sponsored Faculty Panel on Free Speech, the audience applauded when professor john a. powell said “the defining issue of the country is white supremacy” and not free speech. It was refreshing to hear this after every other panelist (including Chancellor Carol Christ and Chemerinsky), all of whom were white, failed to even mention the issue. Free speech does matter, but discussing it is useless without the pressing context of racism. “Free speech” alone cannot explain why the administration just spent $800,000 on an unsponsored, 15-minute appearance by the racist Milo Yiannopoulos. To explain that, we have to include an analysis of the growing far right movement that is trying to use Berkeley as a hunting ground. We have to contrast the city’s protection of racists to its rejection of thousands of anti-racist protesters, to whom it denied rally space Aug. 27. When we talk about free speech, we have to talk about the “Palestine Exception to Free Speech,” the administration’s temporary suspension of a Palestine-related course last year, and chilling posters on campus smearing Palestine scholars as “terrorist supporters.” Both the administration and Chemerinsky, however, disregard this context of racism. Chancellor Christ has only once publicly mentioned “racism,” and that was only to describe how it makes “the issue of free speech even more tense.” The administration, by not discussing the serious threat posed by violent bigots and police militarization, gives legitimacy to the far-right’s facade of “free speech.” Chemerinsky unfortunately contributes to and legitimizes this distorted conception of free speech sans racism. This also means that suppression of anti-racist speech is left out of the conversation, which instead becomes exclusively about how the rights of racists and right-wingers are supposedly under attack. The problem, however, is that the book’s comprehensive title, Free Speech on Campus, is not reflected in its content. Chemerinsky does not discuss the campaign against pro-Palestine activism, which Glenn Greenwald refers to as the “greatest threat to free speech in the West.” In a 2015 report on “The Palestine Exception to Free Speech” and a 2016 update, the Center for Constitutional Rights and the Palestine Legal detail hundreds of incidents of suppression of Palestinian human rights advocacy, the majority of which are on college campuses. Chemerinsky focuses almost exclusively on calls to silence racist and right-wing speech. He makes only one mention of Steven Salaita, whose offer for a tenured position at the University of Illinois was withdrawn because of his critical tweets about Israel during its 2014 invasion of Gaza. That is one of only three mentions in the book of suppression of pro-Palestine advocacy. This is especially troubling because of Chemerinsky’s explanation of why many liberal students today are not free speech absolutists. He says the problem is that his generation grew up when anti-war activists were facing state repression of their speech, but the current generation “did not grow up at a time when the act of punishing speech was associated with undermining other worthwhile values.” However, Salaita is just one of hundreds of examples of the concerted, ongoing campaign to punish anti-racist speech. Chemerinsky fails to foreground or seriously discuss this major campus free speech issue and in doing so actually contributes to the problem of non-association between speech and “other worthwhile values” like anti-racism. Everyone opposed to white supremacy should defend the right to free speech, because we need it to build a strong movement . We should reject Christ’s use of “free speech” as a cover to militarize the campus and provide a $800,000 platform for far-right provocateurs, and we should criticize Chemerinsky’s inattention to the Palestine exception to free speech. Anti-racists need to develop and assert a fuller vision of the right to free speech. Mukund Rathi is a law student at UC Berkeley. During the fall semester of 2016, pressure on UC Berkeley administrators from off campus organizations resulted in the suspension of a student led course on Palestine – Ethnic Studies 198: Palestine: A Settler Colonial Analysis. The cancellation of the course was a violation of free speech and academic freedom and raised a number of questions about governance and procedure at the university. This marks the second time that an anti-Palestinian organization has attempted to cancel a student led course on Palestine at the UC system. After strong pushback from students, faculty, lawyers, and academic associations, the course was formally reinstated on September 19th, 2016. From the Daily Cal: More than 100 students, professors, UC alumni and other community members gathered in Anna Head Alumnae Hall to voice their opinions on Senate Bill 11, titled “A Bill in Support of the Free Flow of Ideas and International Academic Collaboration,” which was sponsored by Student Action Senator Ori Herschmann. The bill called for the ASUC to endorse “academic freedom” and to support academic exchanges such as those between UC Berkeley and Israeli academic institutions. In particular, the bill called for the ASUC to reject academic boycotts against Israeli academic institutions, such as those by the American Studies Association and the Association for Asian American Studies. The American Studies Association voted to boycott Israeli academic institutions on the grounds that these institutions are subject to state policies that allegedly violate human rights. The bill also called for the ASUC to denounce a student-organized event scheduled for next week that, among other points, advocates an academic boycott of Israel. The International Day of Action on College Campuses for Palestine, scheduled for Tuesday, calls for no “academic complicity” with the Israeli government, according to the event’s Facebook page — including no study abroad programs in Israel and no joint research or conferences with Israeli institutions. Such academic boycotts, the bill asserts, are violations of academic freedom. When the committee floor opened for public comment, many opponents of the bill brought up the institutional academic roadblocks for Palestinian students under Israeli law. Viveka Jagadeesan, a campus junior and member of Students for Justice in Palestine at UC Berkeley, opposed the bill, saying its language was problematic. She said it failed to clarify that the academic boycott applies only to Israeli institutions with “discriminatory policies,” not to individual Israeli academics. Additionally, she said the contents of the bill contradicted its claim to support free speech. “When I read the bill, I was quite struck that the bill claimed to support the free flow of ideas when one of its calls to action was to condemn a student-organized event on campus,” Jagadeesan said. As part of SB 160, the External Vice President of the Associated Students of the University of California Berkeley has written a letter to other UC student leaders explaining SB 160 and encouraging similar divestment bills across the UC. Download the letter in PDF form here. I am writing as the External Vice President of the Associated Students of the University of California Berkeley to share with you news of a recent bill passed by our student senate, SB 160, “A Bill in Support of Human Rights in the West Bank and Gaza Strip.” You can find a copy of this bill attached. SB 160 is a positive step toward increased corporate social responsibility. Specifically, it calls on the Regents to engage in targeted divestment of university funds from companies profiting from human rights violations in the Occupied Palestinian Territories. Companies the UC invests in that are mentioned in the bill include Caterpillar, Cement Roadstone Holdings, and Hewlett Packard. These companies have assisted the Israeli military in the illegal demolition of Palestinian homes, the creation of an illegal separation wall beyond Israel’s internationally recognized borders, and in the systematic and discriminatory violation of Palestinian freedom of movement internal to the Palestinian Territories, as documented by numerous human rights groups cited in our bill and elsewhere. By profiting from these investments our university maintains a relationship of complicity with these crimes, which SB 160 seeks to stop. Not only are we as students benefiting from these human rights abuses, but some students among us also are suffering directly from them as well, notably Palestinian students across the UC system who are put in the discomfiting position of knowing that their school is profiting from the demolition of their own family’s homes and from a violent, discriminatory occupation that harms them and their loved ones. We encourage you to do the same and support similar divestment at your campuses, if you have not yet done so. In the wake of the ASUC Senate’s passage of SB 160, “A Bill In Support of Human Rights in the West Bank and Gaza Strip,” I want to offer some thoughts about how we can move forward as a campus community. I also want to acknowledge that this may be the first step in a process that could, among other things, include consideration of other proposed bills that support Israeli-Palestinian cooperation. As you all know, the ASUC is an independent student organization, and its vote in this matter will not change investment policy established by the Regents of the University of California. In addition, it is my personal opinion that targeting a single nation or state in this highly complex world is not appropriate and does little to advance the cause of peace and coexistence. Ultimately, we believe that engaging in dialogue on these difficult issues is the best hope that we have for achieving peace. It is the path that we hope world leaders will follow and our students will emulate. This, of course, is not the first time that the Israeli divestment issue has arisen on this campus and I sincerely hope that we can avoid the rancor and divisiveness that arose in the wake of a previous ASUC vote in 2010, even as we support every student’s right to freedom of expression and acknowledge the diversity of views on the Israeli-Palestinian conflict. As Chancellor, a pillar of my vision for UC Berkeley has been to create a campus where equity and inclusion are fundamental values that sustain our principles of community and allow freedom of expression to occur through civilized and informed debate. At the same time, all of our students must feel that the campus is a safe and inclusive environment for them, one in which they have the freedom to express their views without fear of intimidation. In fact, UCPD has informed me of its investigation into a recent incident on Sproul Plaza in which, according to preliminary eyewitness accounts, a Berkeley student handing out pro-divestment flyers was struck in the face. I am deeply concerned by these initial reports and must state in no uncertain terms that this behavior is unacceptable in our community. We will take firm steps to bring perpetrators of such acts to justice. Our Principles of Community require that debate on our campus–even debate over emotional and important issues such as these–remain civil and respectful. I and members of my administration will continue to work hard to build and sustain the sort of campus climate that I believe we all benefit from. We will also continue to support efforts like The Olive Tree Initiative, a student-led endeavor that is fostering dialogue and discussion here on campus and in the Middle East. Above all, we hope and expect that the ongoing discussion and dialogue about the conflicts in the Middle East will happen in a manner that respects and acknowledges the views and beliefs of others. Rossman-Benjamin, as The Electronic Intifada has extensively reported, is the co-founder of an outside political group, the Amcha Initiative, which seeks out students and professors who criticize Israel or engage in Palestine solidarity activism, accuse them of “anti-Semitism,” and urge university administrations — or state officials — to take punitive action against them. 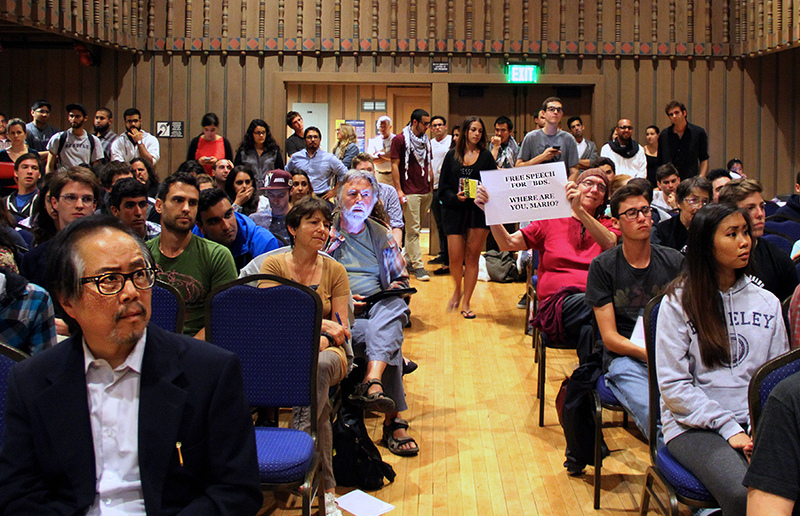 A video has surfaced, showing UC Santa Cruz Hebrew lecturer Tammi Rossman Benjamin making extremely offensive comments about the Muslim Students Association and Students for Justice in Palestine groups at an off-campus event in June 2012. Benjamin describes their members as “foreign students who come from countries and cultures where anti-Semitism is how they think about the world.” She makes openly racist and defamatory claims that MSA and SJP are connected to terrorist organizations like Hamas, Hezbollah, and the Muslim Brotherhood. Benjamin also singles these student activists out from all others, saying, “These are not your ordinary student groups like College Republicans or Young Democrats. These are students who come with a serious agenda, who have ties to terrorist organizations”. These comments reflect the worst stereotypes and slurs leveled at Arab and Muslim communities in the post-9/11 era. They have absolutely no place in a university environment and it is completely unacceptable for a University of California lecturer to be making them, especially about students. What is even worse is that these comments are part of a pattern, one that the University of California Office of the President has been complicit in promoting. Tammi Benjamin leads an extreme pro-Israel group called the Amcha Initiative, which has launched a series of censorship attempts targeting UC and California State University academics and student groups, based on claims that academic critique of Israel is tantamount to anti-Semitism. In 2011 they filed a complaint against UCLA professor David Shorter for linking to a page related to the Palestinian Boycott Divestment and Sanctions movement on a class website, prompting an improper investigation that was eventually dismissed. In February 2012 the Amcha Initiativetried and failed to shut down Israeli historian Illan Pappe’s speaking tour at CSU campuses, falsely claiming that he was “anti-Semitic” and supportive of terror. Tammi Benjamin was also behind a federal complaint alleging that campus political and academic speech critical of Israel creates a hostile environment for Jewish students at UC Santa Cruz, resulting in an ongoing Department of Education investigation into the school. The ACLU recently condemned the federal investigation into UC Santa Cruz as “disturbing” and having “a chilling effect” on student organizing in a letter criticizing a similar investigation at UC Berkeley. In March 2012, Tammi Benjamin and the Amcha Initiative sent a letter to UC President Mark Yudof with racist rhetoric tying student groups to terror, and misrepresenting an incident at UC Davis. The next day President Yudof responded with a system-wide email that adopted the Amcha Initiative’s false narrative, without any condemnation of their inflammatory language or baseless claims. It is no wonder that Tammi Benjamin felt comfortable publicly claiming students were tied to terrorism last June, when the University has rewarded her organization for doing so in the past. These actions are damaging to Muslim and Arab students and their allies, and promote an environment where students are open targets for hate groups. The University of California and the Office of the President must take a clear stand against hate speech directed at marginalized communities, and distance itself from extremists like Tammi Benjamin and the Amcha Initiative that work to smear and silence student human rights campaigners. -Release a statement from the UC President’s Office condemning Tammi Benjamin’s hateful comments in the video and previous Amcha Initiative statements. -End any UC cooperation and communication with extremist groups like the Amcha Initiative that target advocates for human rights. -Formally retract any statements issued at the request of the Amcha Initiative, and take proactive steps to address the negative impact the UC’s past cooperation with the group has had on free speech and campus climate for Muslim and Arab students and groups like SJP and MSA.